Vorwerk & Wilson Families - Ludwig August Laurier Jr.
Ludwig August Laurier Jr. was born on 7 March 1929 in Bergen County, New Jersey. Ludwig August Laurier and Zenobia Loretta Mittag appeared in the US federal census of 1 April 1930 in Park Ridge, Bergen County, New Jersey, at Colony Avenue. Other members of the household included Ludwig August Laurier Jr., Eugene James Laurier and Lois Laurier. Ludwig August Laurier and Zenobia Loretta Mittag appeared in the US federal census of 1 April 1940 in Park Ridge, Bergen County, New Jersey, at 49 Colony Avenue. Other members of the household included Ludwig August Laurier Jr., Lois Laurier and Eugene James Laurier. About 1949, cousins Lud Laurier and Marilyn Mittag served as models for a technical article about synthetic detergents -- pictured washing dishes in sea water. 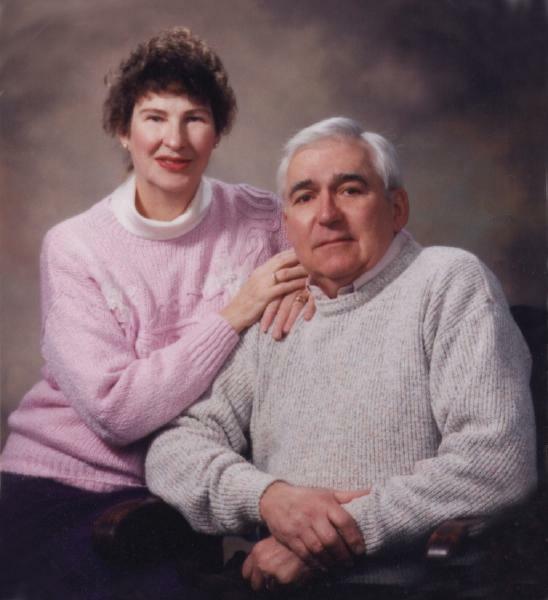 Lud and Margaret Laurier celebrated their 50th wedding anniversary with a large and lively party at the Seneca Castle Fire Hall on 26 August 2000, with many family members and friends in attendance. Ludwig August Laurier Jr. died on 28 October 2014 at age 85 in Clifton Springs, Ontario County, New York, at his residence. The following appeared on 2 November 2014 in the Finger Lakes Times: (Clifton Springs) Ludwig A. Laurier Jr. passed away peacefully at his home in Clifton Springs with his family by his side on Tuesday (October 28, 2014). Friends may call Saturday (November 8) from 10:00 a.m. to 11:00 a.m. at the Patrick Funeral Home, 26 West Main Street, Clifton Springs. Funeral services will immediately follow 11:00 a.m. at the funeral home. Contributions may be made to Habitat for Humanity in Lud's memory. Lud was born March 17, 1929 in Hackensack, N.J., the son of the late Ludwig Sr. and Zenobia Mittag Laurier. Lud grew up in Park Ridge, N.J. After graduating high school he attended Ohio University. Lud married Margaret Kuchar August 27, 1950, a marriage of 64 years. In 1963 Lud and his family moved to Walton, N.Y., where Lud worked in electrical, plumbing, and heating trades. Meanwhile he completed his BA degree through Excelsior College then he taught the trades for many years at Delaware - Chenango BOCES. After retiring and moving to Phelps in 1993, Lud worked as a volunteer for Habitat for Humanity, and helped construct several homes. Lud is survived by his wife, Margaret; children, Daniel (Lib) Laurier of South Carolina, Keith (Alison) Laurier of Canadice, and Sue Ann (Frank) Fisher of Waterloo; grandsons, Christian, Alex, James and Ian Fisher all of Waterloo.